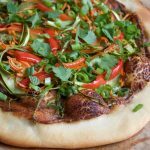 Vegan Asian Spring Roll Pizza! 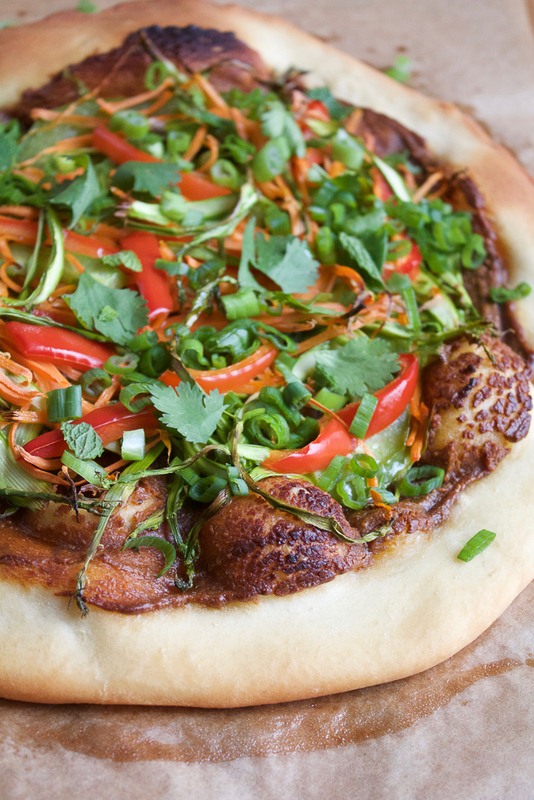 Everything fresh and delicious you love about Asian Spring Rolls. . on a pizza! 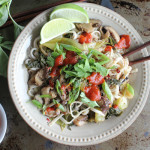 And the spicy peanut sauce has amazing flavor that ties everything together! You will love this pizza! This has been the craziest week ever! Monday I was super sore since I ran a half marathon last Saturday. I actually made pretty good time (13.1 miles and I ran it in 2 hours 23 minutes). My training regimen kinda sucked and I was hoping to barely get by but then I saw the pacers. Pacers are runners who set the pace, so if you are trying to run a race within a certain time, you run with them to make sure you are hitting your time. I saw the 2 hrs 30 min pacer and was able to run ahead of him and stayed ahead until the end. I actually also had to stop to use the bathroom which took a few minutes so who knows. . my time could have been better. But anyway, I’m just thrilled that I got it done! And now my friends and I have a 20k (12.4 miles) set for May 7th. No pain, no gain right? At least that’s what I’m telling myself. I haven’t done a thing, exercise-wise this week . . but today I am going to a new pure barre class. The one with the platform! This is going to be my first class and I heard it’s killer. I believe we basically do all the same moves but on a raised platform. I’m scared! And Wednesday, I went live on my local news station to talk about spring produce and some of my favorite things to make for spring; you can watch it here. I showed my Shaved Asparagus and Pesto Pizza, my Fennel and Apple Salad and my spring inspired (with roasted asparagus) Asian Spring Rolls. Whenever I make spring rolls, I always cut and prep a ton of veggies because I leave them in the fridge to make more rolls when I want them. . but this time, since I also had some leftover pizza dough, I made this pizza! 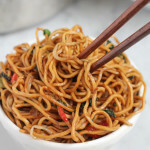 I had my leftover spicy Asian peanut sauce and thought . . why not?! and you know what? This pizza is sooooooo good! and it’s all vegetarian and VEGAN! 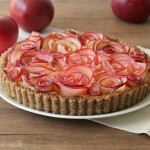 And if you’re making anything with spring produce, SHOW ME! I’d love to see it! Use #News3SpringEats and share it on social media! Use the leftover peanut sauce for a dipping sauce with raw veggies, it's delicious! Using a large to medium sized mixing bowl, whisk together all of the ingredients, from the peanut butter to the sesame oil. Alternatively, you can also blend together in a food chopper or mini food processor if desired. You don't want the sauce to be too watery. Make sure it's a nice thick sauce that you can spread on your pizza dough. Roll out your store bought pizza dough and transfer to a baking sheet or pizza stone. 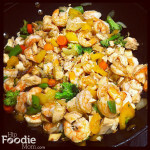 Spread on about 2 to 3 tablespoons of the peanut sauce and bake the pizza for about 8 to 10 minutes. 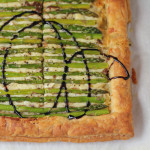 Remove from the oven, top with the shaved asparagus, green and red bell peppers and the carrots and bake in the oven for about 20 minutes, or until the crust is nicely browned. Remove from the oven. 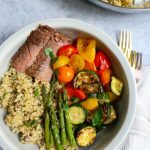 Allow to cool for 1 minute and then drizzle on some olive oil and sprinkle with just a little of each of the fresh cilantro, mint, basil and scallions. You can also sprinkle on come crushed peanuts! Slice, serve and enjoy immediately. No pain, no gain indeed! As long as it’s not pushed too far: it has to be fun as well. 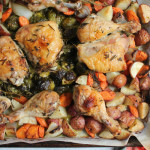 This recipe looks delicious, love the creativity! And pizza is always good. Thank you, John! Happy Friday! You are killing it, Alice! At this rate, you’re going to be one of those ultra-runners. They are NUTS. They run hundreds of miles at a shot! And what did you think of the platform? I tried it and it basically added in an extra shot of cardio. We love that, right? 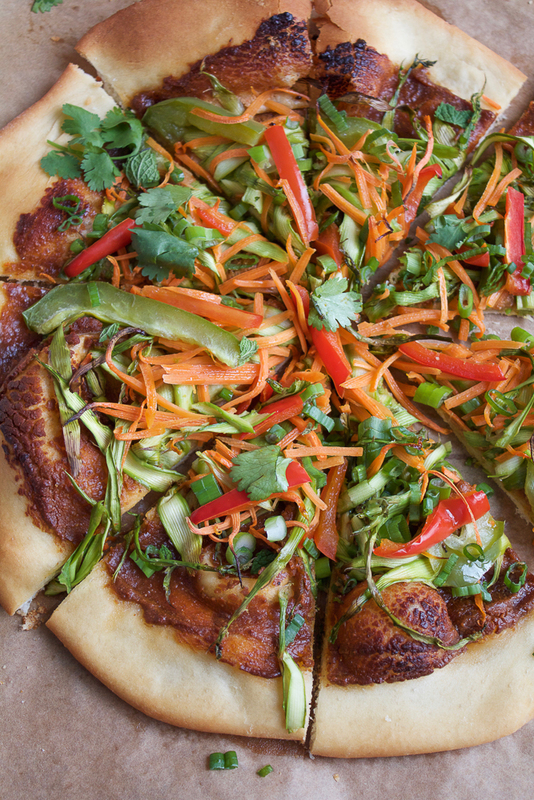 Putting peanut sauce on pizza should’ve happened a LONG time ago. It’s awesome that you were on TV (I love those summer rolls you make), and I’m sure you were amazing! Sounds like you had quite a week, Alice! Congrats again on the marathon and being on TV. 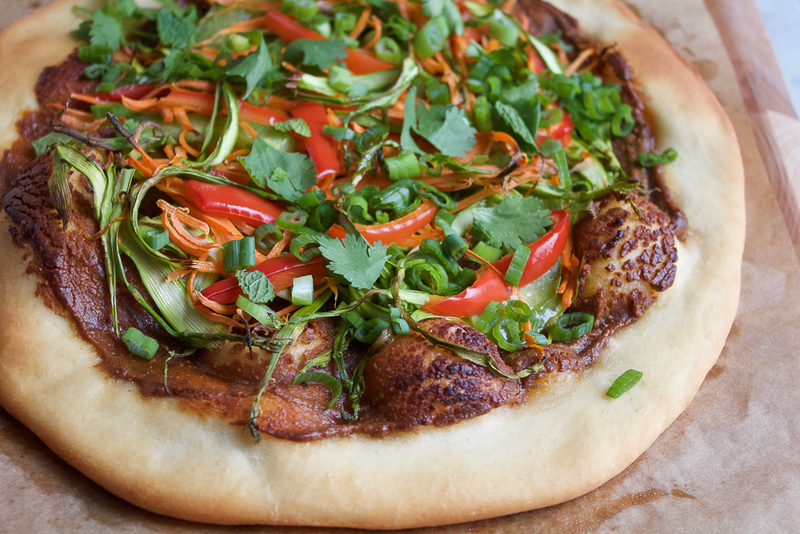 I think you deserve LOTS of this spring roll pizza! Looks so good! I love the creative twist, and so perfect for Friday! Great TV set Alice! 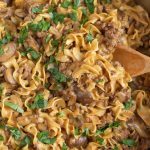 You are one Hip Foodie Mom! Loving the twist on the pizza, Alice! And that peanut sauce sounds amaaazing 🙂 Wow, you ran a half marathon last Saturday?! That’s awesome! I run regularly, but never a marathon. I had a cold the other week so looking forward to getting back into my regular exercise regime. This pizza would certainly be a nice treat after having a long run; love all the veggies on there! Have a great weekend! Sheeesh – I’m pretty sure the only way I could accomplish all you’ve done this week is in a dream! You rock, girlfriend! And so does this pizza! Anything with peanut sauce is a treat. Have a great weekend! You are killing it, Alice! What better way to end a busy week than with this pizza. Love the asian spring roll flavors. It sounds wonderful! Congrats on your marathon Alice! 🙂 Keep going! 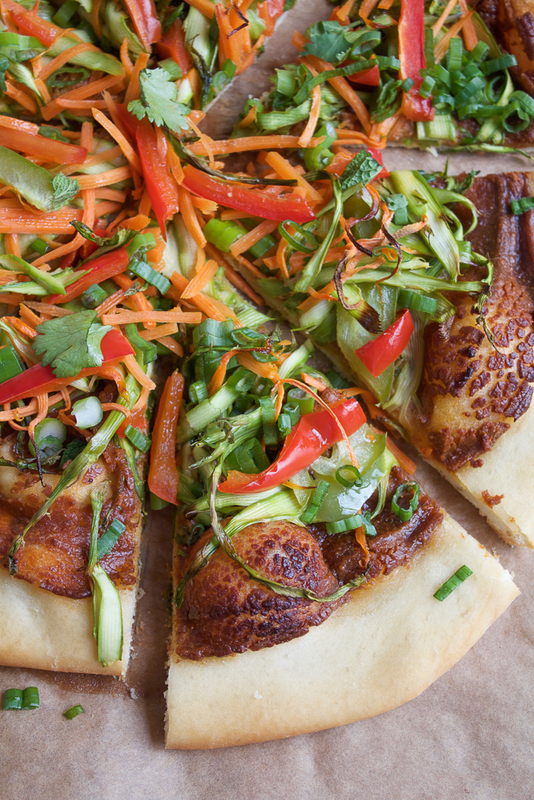 love this pizza, it’s so bright and full of veggies, just how I love my pizza! So gorgeous, I love all the fresh veggies on top of your pizza.. perfection! You truly are rocking it my friend. That timing is indeed awesome and how fun for your 20..ALL the very best. Loving this pizza. So so yum! Congrats again on running the marathon Alice! Sounds like a crazy week 🙂 This pizza is gorgeous! Love the crust! I’ve been a little obsessed with pizza lately! Pinned! I have to say that this is the best Vegan pizza I’ve ever tried. I was generous with lime juice and ate it with Sriracha sauce. So good! What is also awesome is this pizza. I am loving the sound of the peanut sauce on it. 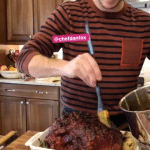 I would not want to share this!! Congrats on your fabulous time! And you’re doing another? Way to go. Great job on the half! I’m sure this pizza would be great at the finish line 😉 I love these ingredients and truly hope to try it soon! Yay, way to go on the half, Alice! You totally deserve some rest after a crazy week and pizza is always a great choice! Love the Asian spring roll toppings! It looks amazing! Great recipe. I’m always looking for interesting topping ideas for pizza. Wow, congrats on finishing a half marathon. Serious goals. If I could even run 3 miles without stopping, that would be quite a feat for me…definitely not a runner! Hahah, but this spring roll pizza looks AMAZING! Might be good with some fish sauce, although I can imagine not many people would be quite a fan of the stench. Fish sauce is SO good though!